ATLANTA (April 7, 2019) – The winners of the 2019 Naismith Defensive Player of the Year Award presented by Bona for men’s and women’s basketball both hail from the Pac-12 Conference as Matisse Thybulle (Washington) and Kristine Anigwe (California), respectively, claim top honors in the second year of this award. 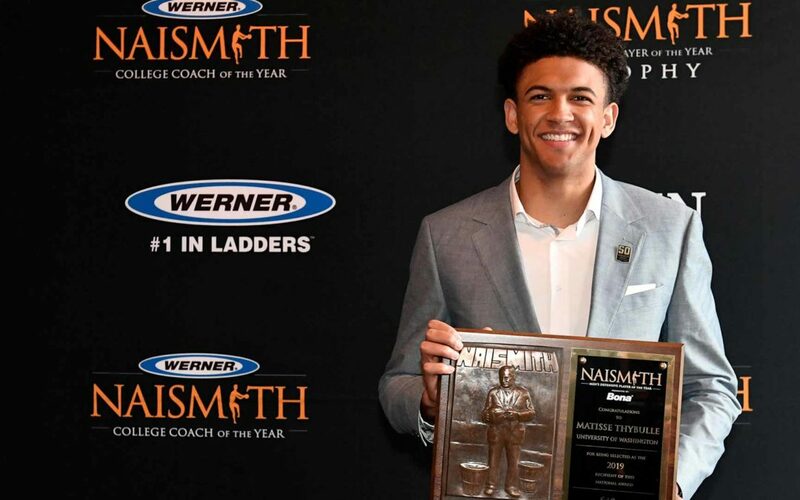 The winners were announced today by the Atlanta Tipoff Club, as Thybulle was honored at the Naismith Awards Brunch presented by Mortenson, edging out the other finalists, Brandon Clarke (Gonzaga), De’Andre Hunter (Virginia) and Zion Williamson (Duke). Anigwe will be honored at her school at a later date. She takes home the win over fellow finalists, Lauren Cox (Baylor), Ae’Rianna Harris (Purdue) and last year’s winner, Teaira McCowan (Mississippi State). Thybulle was just the second player in Pacific-12 Conference (Pac-12) history to be honored as the conference Defensive Player of the Year two years in a row. The senior guard ended his season with 126 steals and notched a team-high 83 blocks, making him the only player in the last 20 seasons to record both 100 steals and 80 blocks in the same year. He is one of just three players to average 2.0 bpg and 2.0 spg in a season, leading the Huskies to the Second Round of the NCAA Tournament. Anigwe was named Pac-12 Defensive Player of the Year this season. She ended her season with an average of 22.5 ppg and a total of 57 blocks, and she was the top rebounder in the nation with an average of 16.3 rpg. The California senior has a streak of 33 consecutive games with double-doubles, including her last game of the regular season where she had a 32-point, 30-rebound performance. Anigwe led her team to the Second Round of the NCAA Tournament. The winners were chosen by the Atlanta Tipoff Club’s board of selectors, comprised of leading journalists from around the country, who based their selections on outstanding on-court defensive performances during the 2018-19 college basketball season. Bona is an innovative, environmentally-conscious company dedicated to creating beautiful floors since 1919. Bona US, the North American subsidiary of BonaAB in Malmö, Sweden, manufactures and distributes floor care and home cleaning products. For decades, most professional and collegiate athletes have played on floors finished with Bona Sport® waterborne finishes, sealers and paints. Bona provides the most complete system of sport products in the industry including waterborne and oil modified finishes, paint, machines, abrasives, adhesives and a fast, effective maintenance system. From residue-free hardwood floor cleaners to a beautiful array of stains and high durability finishes, consumers, distributors and contractors trust Bona. For more information, please contact Bona US at (800) 872-5515 or www.bona.com.